July 15, 2018. 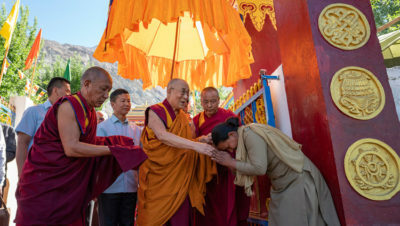 Sumur, Nubra Valley, Ladakh, J&K, India – This morning His Holiness the Dalai Lama left his quarters on top of Samstanling Monastery and walked down to visit the temple below. He inspected the painting of the Wheel of Life on the veranda before going inside to see and pay his respects before the statues of Buddha Shakyamuni, Je Tsongkhapa, and Thousand Armed Avalokiteshvara. Emerging into the sunshine, he stopped to talk to a group of Westerners, telling them that all human beings are physically, mentally and emotionally the same, so it is essential to acknowledge the oneness of humanity. He conceded that there are differences among us of religion, nationality, race, prosperity and so forth, but they are of secondary importance. At the foot of the monastery steps groups of Ladakhis waited to greet him. His Holiness shook hands with some, teased others and posed for photographs with them in groups. He continued his walk to the teaching ground where he joined in auspicious prayers to mark its inauguration and lit the lamp of wisdom. As is his custom, His Holiness tried to extend his greetings to as many people in the crowd of more than 8,000 as possible, smiling and saluting them with folded hands in each direction. When he waved to the school-children, they joyfully waved back. Ganden Trisur, Rizong Rinpoche, who, as Abbot of Samstanling Monastery, is the host for this event, the Great Summer Debate, spoke first. He welcomed everyone and mentioned the importance for Buddhists of combining the awakening mind of bodhichitta, which arises out of love and compassion, with wisdom, a clear understanding of emptiness. He went on to highlight the unique quality of the Buddha’s teaching – emptiness of intrinsic existence based on dependent arising – which is why the Buddha is known as an incomparable teacher. He mentioned a prophecy in which the Buddha predicted that Je Tsongkhapa would appear and found a monastery called Ganden, something of significance to the people of the Himalayan region as much as to Tibetans. Ganden Trisur Rinpoche went on to mention other prophecies the Buddha made about the appearance of Avalokiteshvara in the Land of Snows to the north of Bodhgaya. 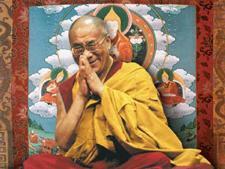 Forty-six emanations in India and Tibet included the early Dharma kings and the series of Dalai Lamas. Rinpoche referred to His Holiness’s achievements in introducing democracy to the Tibetan community and proposing the explicitly non-violent Middle Way Approach to resolving Tibet’s problems. Rinpoche referred to His Holiness’s ability to fulfil people’s wish for teachings whether they consider themselves Nyingma, Sakya, Kagyu or Geluk. He counselled the audience to feel fortunate in being able to see and listen to His Holiness and to pray that he lives long. He noted, as His Holiness does, that the Buddha’s teachings can be categorized into scripture and realization—and that the way to preserve them involves study and practice. He ended by thanking Geshe Yeshey Gyaltsen for establishing the use of logic and debate at Samstanling that has ripened in the opportunity to stage this Great Summer Debate. In his turn, Geshe Yeshey Gyaltsen, who is also a Ladakhi, explained that in 1998, Rizong Rinpoche, who was then Jangtse Chöjey, invited him to come and teach philosophy at Samstanling. Since then, it has been possible to send ten monks a year to study and train at Gomang Monastery re-established in South India. These monks have become sufficiently skilled to be able to debate in front of His Holiness. He stated that he had done his best to keep the Nalanda Tradition alive, with the result that these days lay people too are studying Buddhist philosophy. In conclusion he asked for opinions and advice about a proposal he has made to the monks he has taught, who have graduated as Geshes. He encourages them, once they have graduated, to select one of the five classic topics of study and focus further study more intensely on that. His Holiness responded immediately that there are 1000 fully qualified Geshes in the monasteries in South India. ”Once they graduate,” he chuckled, “some want to go to the USA and Europe, but others stay back to continue to study. Certainly, it would be good to choose to study logic, Madhyamaka, Perfection of Wisdom and so forth in greater depth. This would involve becoming better acquainted with the commentaries of great Indian masters found in the Tengyur. When I went to Situ Rinpoche’s monastery, Sherabling, the monks had done just that—and they were very impressive. I’ve similarly asked the monks of Namdroling Monastery in the south to make themselves familiar with Shantarakshita’s ‘Compendium of Reality’ (Tattvasamgraha). President of the Nubra Valley Muslim community, Muhammad Akram, spoke next and welcomed all the dignitaries and guests, especially His Holiness. He thanked Rizong Rinpoche and Thiksey Rinpoche for inviting him to Nubra once again. He recalled that His Holiness had visited the new mosque in Diskit on Friday, the Muslim holy day, with some pride, and ended with a wish that peace, harmony and friendship may flourish in the world. President of the Ladakh Buddhist Association, Tsewang Thinles spoke about the success of the Great Summer Debate, now in its sixth year in Ladakh. He also noted that lay-people’s awareness of what Buddhism is really about has been growing steadily. He remarked that members of the Drikung Kagyu have expressed an interest in hosting the Great Summer Debate in future. He reiterated that all Ladakhis have a responsibility to ensure that peace and harmony prevails in the community at large. Members of lay-people’s study group at Tiggur, most of them women, debated about the qualities of the Three Jewels. In his remarks, the Abbot of Gomang Monastery, who is also a Ladakhi, celebrated the sixth occasion that the Great Summer Debate has been held. A similar event used to take place in Tibet at Sangphu Monastery. One difference is that in Tibet monks organised everything, whereas here in Ladakh monks, nuns, lay-people and even members of the Muslim community, have worked together make it a success. He called it a historic landmark for cooperation. He thanked Geshe Yeshey Gyaltsen for his hard work as a result of which many of his students are following in the footsteps of Rizong Rinpoche, who eventually became the Ganden Throneholder. Samstanling is a small monastery, yet it has produced many good scholars. Although Tibetans in India are refugees, people from the Himalayan Regions who join their monasteries and nunneries have been provided equal opportunities to study and serve the community, for which he thanked His Holiness. Local MLA Tenzin Namgyal observed that in an increasingly materialistic and competitive world, the teachings of the Buddha can help restore integrity. He recommended applying what can be learned about the workings of the mind and tackling destructive emotions. MP Thubten Tsewang added that while material development is both necessary and desirable, it cannot be at the cost of inner peace. Therefore, we have to learn how to achieve and maintain peace of mind. Mementos of the occasion were presented first to His Holiness and then to Ganden Trisur, Rizong Rinpoche, after which His Holiness was invited to address the congregation. “Homage to Manjushri,” he began. “Welcome to my great teacher, Trisur Rinpoche, from whom I have received profound teachings, and welcome to all you other brothers and sisters. Thanks to everyone involved in arranging this Great Summer Debate; you’ve done a good job. Since I’ll be teaching over the next couple of days, I don’t have much to say today. “As someone has already mentioned, in the past in Tibet on the basis of the volumes in the Kangyur and Tengyur we undertook study of the Five Major Sciences: the inner science of Buddhist doctrine and practice, language, logic, medicine and arts and crafts and the Five Minor Sciences of grammar and so forth. “Whether we follow a spiritual path or not, we need to improve our education. And in this, logic and psychology can be very useful. Although great insight can be derived from Buddhist literature we don’t need to deal with it from the point of view of religion, we can take an academic approach. “The logic and epistemology that prevailed in ancient India have lapsed in modern times, but we Tibetans kept them alive in our monasteries. Our studies are rigorous. We memorize texts word by word, study commentaries to them and engage in debate during which we refute others’ positions, assert our own and rebut criticism. Following this tradition kindly introduced by Shantarakshita and Kamalashila, we kept the Nalanda tradition alive. And on the basis of this today I believe we can make a positive contribution to the world. “The psychology of ancient India can effect an inner transformation by enabling us to see how negative emotions lead to negative consequences. It can help us overcome and eliminate them by revealing the workings of our minds and emotions. Just as we can learn how helpful love and compassion can be, we can come to understand that anger, pride, jealousy and arrogance can be detrimental. We can also learn to distinguish arrogant pride, looking down on others, from the useful pride that is involved in boosting our confidence. “Inner transformation is not a matter of faith or prayer. It involves reason and the use of human intelligence. A calm and healthy mind has a very positive effect on our physical health and well-being. “As I mentioned before, the classic texts of Sanskrit Buddhist literature are wonderful, but the insights they contain can be usefully transferred into a simple academic context. “Nevertheless, wherever I go, I never suggest that Buddhism is best or try to propagate it. To do so would be like claiming that one medicine is better than others whatever the circumstances or condition of the patient. Indeed, even the Buddha taught different things at different times to different people, because he taught according to their capacity and disposition. “Training in reason and logic has enabled us to engage usefully in mutually beneficial discussions with modern scientists. We have learned more about the external world and they have learned about the mind.